Posted 1:49 pm by McAlinden Research Partners & filed under Daily Intelligence Briefing, Healthcare. “CRISPR babies” have been on everyone’s lips since news broke last week that Chinese scientists claimed they had produced the first full-term gene edited humans. While it raises a number of questions about the scientific process and ethics, investors should also be aware of how far the technology has come in the last few years, as well as where the many other ongoing CRISPR and gene editing projects will take us in the future. MRP believes professional investors would be well-served to focus on themes in all market environments. 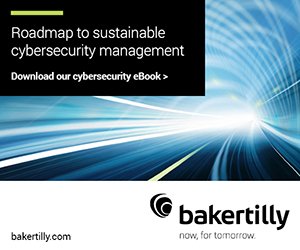 It is the identification of change-driven themes that is our mission at MRP. So, in the face of the recent market turmoil, an update of our own themes is in order. Since March we have added 6 new themes and also eliminated 6. Currently, we have a total of 22 themes that are active. A review of all those active themes follows. Summary: “CRISPR babies” have been on everyone’s lips since news broke last week that Chinese scientists claimed they had produced the first full-term gene edited humans. 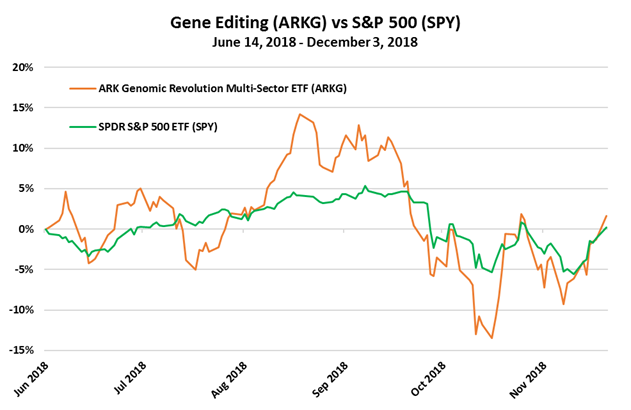 While it raises a number of questions about the scientific process and ethics, investors should also be aware of how far the technology has come in the last few years, as well as where the many other ongoing CRISPR and gene editing projects will take us in the future. Last week, the entire biotech landscape was rocked by Chinese scientist He Jiankui’s claim to have helped produce the first babies — twin girls — born with edited genomes. His team at the Southern University of Science and Technology, in Shenzhen, had been recruiting couples in an effort to create the first gene-edited babies using CRISPR, according to clinical trials. They planned to eliminate a gene called CCR5 in hopes of rendering the offspring resistant to HIV, smallpox, and cholera. CRISPR stands for Clustered Regularly Interspace Short Palindromic Repeats. The process uses specialized strands of DNA that act as molecular “scissors.” These are capable of making cuts in the DNA at specific points, allowing researchers to edit, add or remove faulty genes. He’s team removed an early-stage embryo from a pregnant subject, attempted to use the CRISPR method to damage a specific gene involved in HIV transmission, CCR5, to boost resistance to the virus. While the natural mutation that disables CCR5 is not itself something novel, being relatively common in parts of Northern Europe, it is not currently found in the genomes of China. When the team felt they successfully neutralized the CCR5 gene, they implanted the genetically-altered embryos back into the women who provided them. One subject managed to take their pregnancy to full term, resulting in a successful birth — twin girls Lulu and Nana became the first people to be born with a clinically-altered genome. Although He’s conclusions from the trials have not been released, and it will be some time until we know if Lulu and Nana are in fact immune or resistant to HIV, ethics concerns have been widespread, provoking condemnation for He’s work around the world. This is to be expected and warranted. However, at this point, there is no un-doing this unprecedented experiment and it could completely change the path toward the proliferation of gene editing technology in human healthcare. The truth is that He’s success was only made possible by the huge leaps in progress already accomplished in the field. 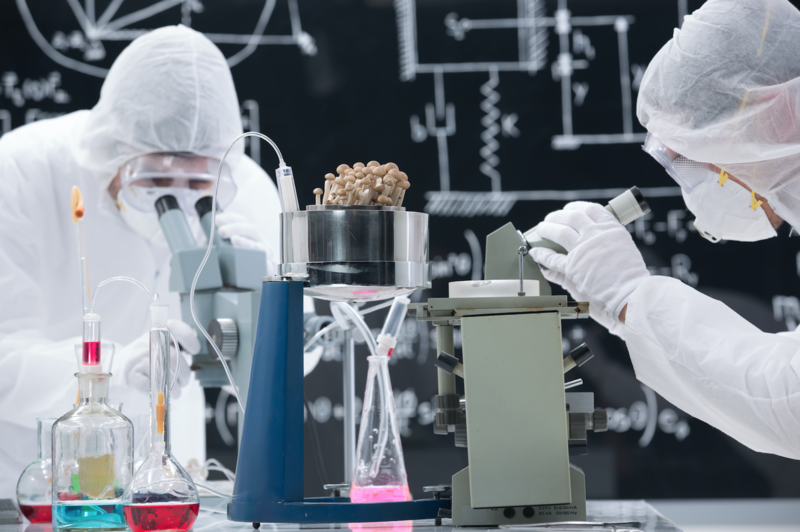 Last year, China spent a record 1.76 trillion yuan ($254 billion) on research and development, and the country is catching up with the US’ investment in the same area, spurring a genetic arms race. In 2016, Chinese scientists broke ground as the first to inject CRISPR-edited cells into a human. It aims to help cancer patients by removing their T-cells, tweaking them to make them more effective at fighting cancer cells, and reintroducing the modified immune cells into the patients’ bloodstreams. The first similar study in the United States is only in the recruiting phase. Earlier this year, Chinese scientists used non-viable embryos to test their ability to correct a mutation that causes Marfan syndrome, an incurable connective tissue disorder that affects about 1 in 5,000 people. A single letter mistake in the gene for FBN1, which codes for the fibrillin protein, can cause a ripple effect of problems—from loose joints to weak vision to life-threatening tears in the heart’s walls. They injected the embryos with a Crispr construct known as a base editor, which swaps out a single DNA nucleotide for another—in this case, removing a “C” and replacing it with a “T”.1 They kept the embryos alive for another two days in the lab, long enough to run tests to see how well the editing worked. Chinese authorities have thus far threatened to come down hard thus far on He and his team since his rogue actions could reflect badly on the regulatory ability of China’s scientific authorities. However, if He’s experiments turn out to be successful, those implications could be very positive. He’s team was actually using materials purchased from two American biotechnology companiesto make edits to human embryos bound for implantation. The documents named Massachusetts-based Thermo Fisher Scientific as the supplier of Cas9—the bacterial protein that clamps onto DNA and delivers a double-stranded slice—and Bay Area startup Synthego as the maker of its synthetic guide RNA. American CRISPR companies, many of them founded or advised by the field’s biggest stars, have also been hard at work to lower the costs and labor associated with gene editing. Their mission is to make CRISPR accessible to everyone. Although those companies are relatively small, much larger corporate operations in CRISPR continue to move forward. This year, Alnylam Pharmaceuticals grabbed approval for a drug that silences RNA, a messenger for DNA. Spark Therapeutics launched the first gene therapy approved in the U.S. And Novartis and Gilead Sciences furthered their cell therapy approaches in cancer. Additionally, Editas Medicine, CRISPR Therapeutics, and Intellia Therapeutics are expected to move further into clinical testing. Some companies will have data for gene therapy in hemophilia, and others could push the bounds of cell therapy. Recently, Editas made headlines when it won FDA approval of its IND application for its Leber Congenital Amaurosis type 10 (LCA 10) candidate EDIT-101, enabling future clinical trials for what could emerge as the first in vivo (involving embryonic subjects) CRISPR genome editing treatment. LCA10 is an eye disorder, caused by a mutation in the CEP290 gene, that primarily affects the retina, which is the specialized tissue at the back of the eye that detects light and color. People with this disorder typically have severe visual impairment beginning in infancy. The visual impairment tends to be stable, although it may worsen very slowly over time. EDIT-101 is designed to eliminate that mutation by using CRISPR to cut out that nucleotide and surrounding DNA, thus restoring normal protein expression and function of remaining photoreceptor cells. Additionally, the next step in gene editing could be right on the precipice of success as Harvard scientist begin working toward germ-line editing in human sperm cells, the process by which the genome of an individual is edited in such a way that the change is heritable. By editing germ cells, Harvard Medical School dean George Daley says they will be possible to remove mutations that cause childhood cancer or cystic fibrosis. Other genetic edits could endow children with protection against common diseases. On the list of their of potentially acceptable genes to edit is CCR5, the same gene He Jiankui already sought to alter, and perhaps, already has. Gene editing is likely to be a defining transformation of the biotech sector over the next few years. 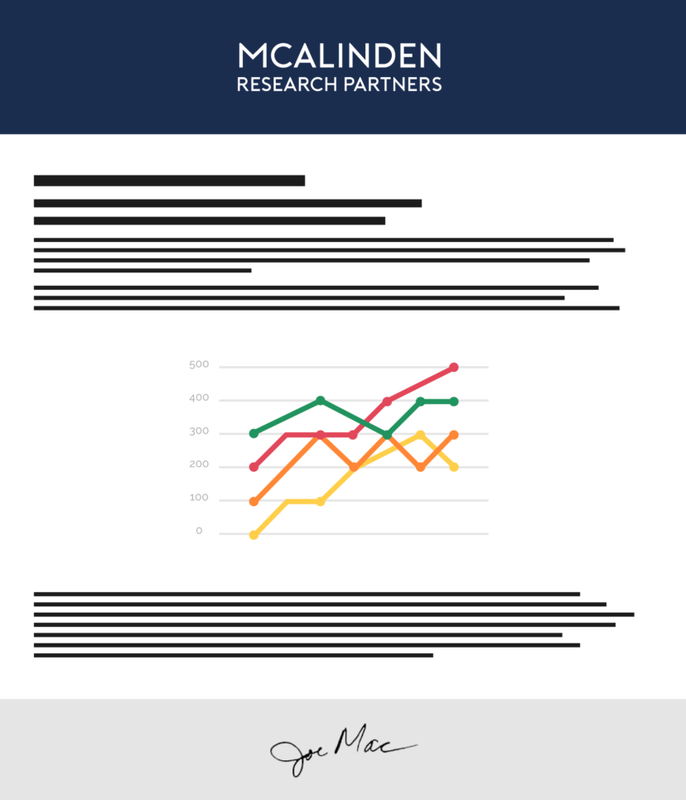 As such, MRP added Long CRISPR to our list of themes on June 14, 2018. 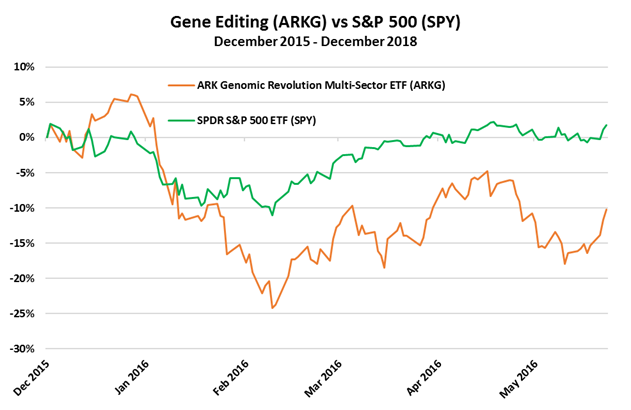 Since then, the ARK Genomic Revolution Multi-Sector ETF (ARKG) been up and down, following strong market fluctuations, but is now slightly outperforming, returning 2% versus a flat S&P 500. We’ve also summarized the following articles related to this topic in the Biotechnologysection of today’s report. The amount of dollar-denominated debt sold by companies and banks has hit its lowest level in two-and-a-half years as the impact of the currency’s appreciation ripples through the bond markets. Dollar-denominated bond sales by companies and financial institutions in developed economies dipped to $1.4tn in the six months to October, down 14% on the previous six-month period to their lowest level since April 2016.As a proportion of global issuance in all currencies, dollar-denominated bond sales fell to 45% in the six months to October, down from a high of 53% in February. Meanwhile, the proportion of new corporate and bank bonds rated triple-B — one notch above junk status, and thus vulnerable to future downgrades — hit 24.7% in the six months to October, the lowest level since mid-2016. TextEuro-area manufacturers saw activity slow further as concern over trade wars and political instability hit demand for machines and other investment goods. IHS Markit’s Purchasing Manager’s Index for factories fell to 51.8 in November from 52 in October, marking the weakest growth in more than two years. The views among companies about prospects for next year are “among the gloomiest seen since the sovereign-debt crisis in 2012” and suggest firms are “bracing themselves for further weak demand in the coming months,” he said. 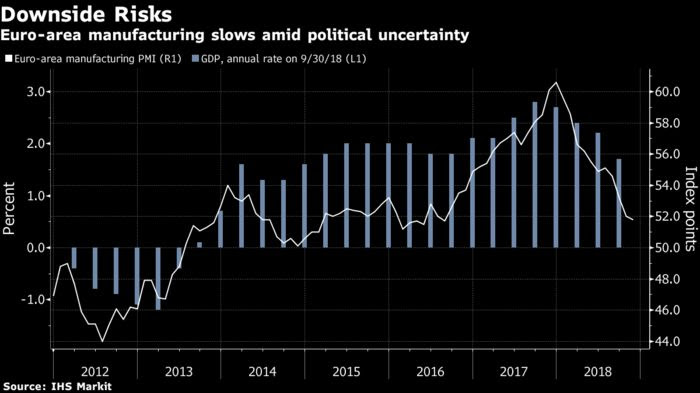 Signs of dwindling investment may dash hopes for a rebound after the euro-area economy posted its slowest expansion since 2014 in the third quarter. Manufacturers reported falling demand in Germany, France and Italy and only a modest increase in orders in Spain, according to Markit. Pressure remains for the People’s Bank of China to lower the required ratio of cash that banks must hold in reserve against deposits, a move that would inject new credit into the economy for the fifth time in 13 months. While sentiment may temporarily improve thanks to the tariff ceasefire agreed to by US President Donald Trump and Chinese President Xi Jinping on Saturday, analysts still doubt it will prevent China’s economy from slowing in the coming quarters. Even if trade negotiations end in a lasting deal, Chinese exports still look set to slow as global growth cools. Slower credit growth and a cooling property market are also likely to intensify in the coming months. The latest official purchasing managers’ index (PMI) data for November shows that manufacturing is no longer expanding on an overall basis, with new orders slowing. The People’s Bank of China has lowered commercial lenders’ reserve requirement ratio – the amount of money that banks are required to hold at the central bank – four times already this year, with the cut announced in October pumping US$110 billion into the banking system. Beijing has also adopted a more proactive fiscal policy, encouraging provincial governments and state-owned enterprises to speed up spending and investment. Americans’ demand for credit declined over the previous year as expected, as mortgage interest rates rose, while the percentage of approved applications also ticked lower compared to a year ago. The New York Fed’s Survey of Consumer Expectations showed respondents who applied over the previous 12 months were granted credit 37.7% of the time, compared to 41.3% in October 2017. Application rates among those surveyed fell to 47.8% from 49% a year ago, even as they ticked up from June’s 43% rate. The Mortgage Bankers Association said U.S. borrowers filed the fewest weekly applications for home refinancing in almost 18 years. The survey, done every four months, showed mortgage refinance application rejections “notably” rose, as did to a lesser extent rejection rates for credit card applications and for credit card limit extensions. Aphria’s experience underscores the swelling demand for labor in Canada’s five-year-old cannabis sector, where openings have tripled in the past year to 34 out of every 10,000 job postings. Canada’s licensed producers employed about 2,400 workers at the end of 2017, and industry employment was around 3,500 people when legalization took effect in mid-October. Between them, eight of Canada’s largest cannabis companies are now actively recruiting for approximately 1,700 positions. Many companies say they expect that number to grow as they expand production facilities after Canada legalized recreational marijuana in October. TextThe US games industry is well-positioned for another year of growth. For the third quarter of the year, Americans spent $9.1 billion on games from July through September, a jump of 24% year-over-year. Combined with the first-half consumer spending total of $19.5 billion (which was itself up 40% year-over-year), that gives the industry a 2018 total to-date of $28.6 billion. The industry is on pace to crush the 2017 full-year total of $36 billion once the crucial fourth quarter numbers are in. (To give an idea of how weighted the industry is to the holiday season, the last three months of 2017 accounted for about $14.7 billion, or 41% of the year’s total. Just days after helping three cellular carriers initiate 5G service in South Korea, Samsung made an interesting announcement in partnership with U.S. carrier Verizon: The companies plan to release “one of the first commercial 5G smartphones” in the first half of 2019, apparently powered not by Samsung’s own chipset, but instead by Qualcomm’s Snapdragon platform, including its X50 5G modem. Today’s announcement is significant because Samsung has been working on its own 5G technologies, including mobile chips, and was a major contributor to the international 5G standard that was finalized late last year and earlier this year. Yet Verizon indicates that Samsung will be showing a “proof of concept” device this week, using Qualcomm’s upcoming flagship mobile platform, antenna modules, and related components. The use of Qualcomm parts simultaneously reflects the San Diego company’s apparent strength in the emerging 5G chip market and the continued struggles of even its largest rivals to miniaturize the high-speed mobile chips.